← Star Wars pendants! In 1979 Nestle wrappers had The Force. After years of hunting – Willy Wonka’s Daredevils – Discovered! Collecting candy is a crazy kind of hobby. Sometimes you can spend years hunting for any trace of a brand or piece of packaging, and never find one. But it’s not always so tough – typically there is a photo or a mention somewhere. With Willy Wonka’s Daredevils, there was no such thing – until last week, this was one of what I call a Sasquatch of candy boxes. Before today, the only evidence you could find of these were the vague recollections and distant memories of those who witnessed them 30 years ago. So it is that I can state with some confidence that the title image for today’s piece represents the first the internet has seen of this hot cinnamon Gobstoppers cousin – well, aside from a sticker – but I’ll get to that. 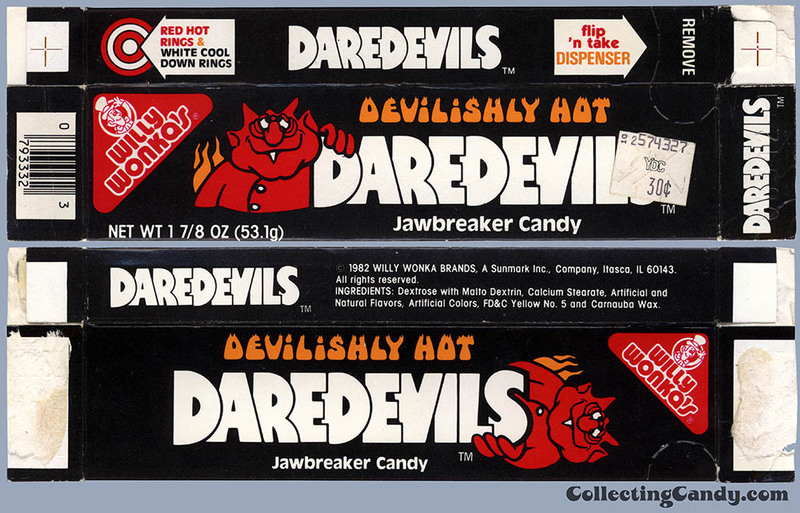 Released in 1982 by the newly-named Willy Wonka Brands division of Sunmark (formerly Breaker Confections) – Daredevils were very simply, a hot variety of Gobstopper. Rather than having multiple rings of flavors like their Gobstopper cousins, Daredevils had rings of hot, interspersed with rings of cool. A pretty great idea and I remember loving these. 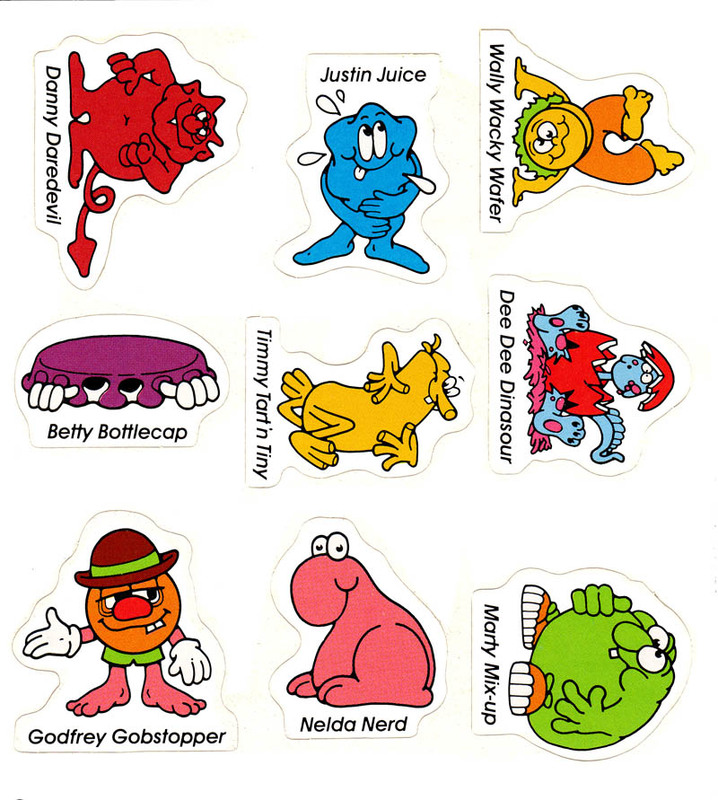 That sticker sheet is remarkable in that it provides names to Wonka mascots I’ve rarely, and in some cases, never seen used anywhere else. 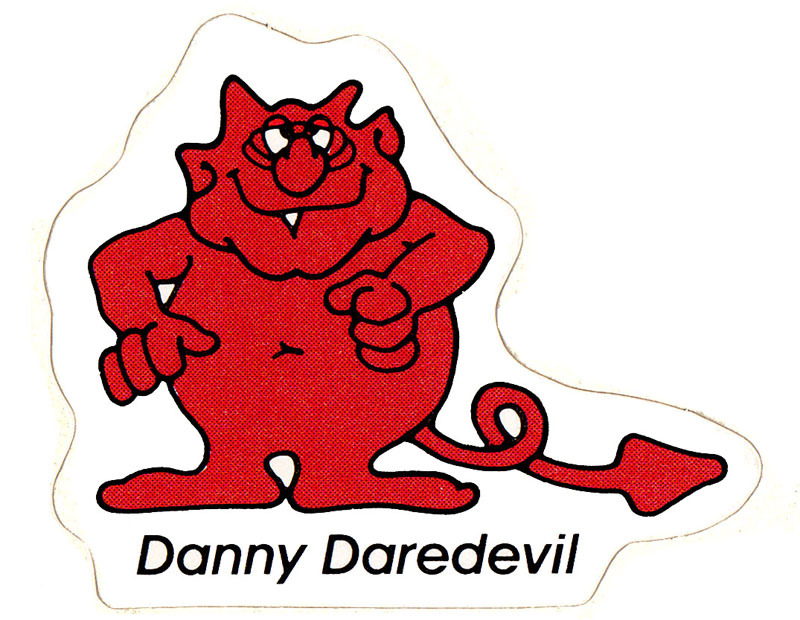 Even the Daredevil got a name. As with any great collector-hunt, finding a piece like this is thrilling. But this thrill is even more profound as this Daredevils discovery is part of a much larger find: I have taken on the curation of another collector’s large confectionery preservation achievement – The L.M. Kallok Collection. I’ll be writing and sharing more about this wondrous collection in the coming months, both here and on my Flickr pages. So stay tuned – it’s going to be a lot of fun. 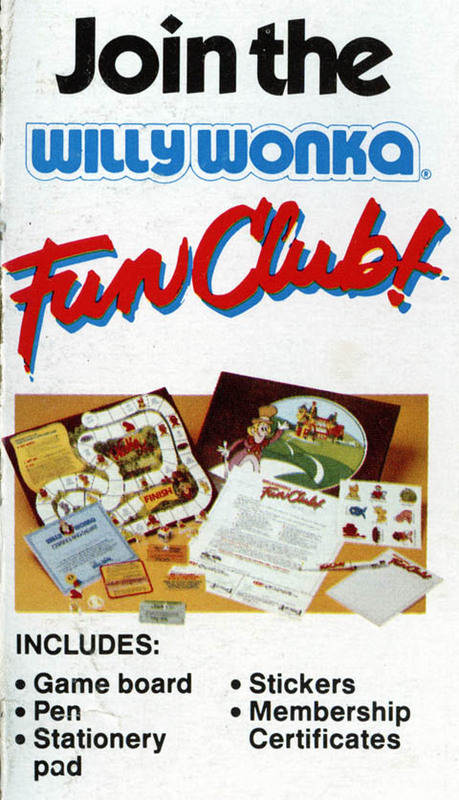 This entry was posted in 1980's, Boxed, Hard Candy, Nestle, Wonka and tagged 1980's, 80's, Breaker, candy, cinnamon, collecting, collection, confection, confectionery, Daredevils, devil, Gobstopper, jawbreaker, mascot, packaging, retro, sweets, vintage, Willy Wonka, Wonka. Bookmark the permalink. 12 Responses to After years of hunting – Willy Wonka’s Daredevils – Discovered! Congrats on the “hot” find! Great post! Super find of such an elusive box!! For me, Daredevils was a favorite back in the day and I’ve been wanting to see/find a box for years. Congrats on the find and hopefully because of your post, more will start showing up. This post made me think of a candy I never got to try, and only saw once, probably sometime in the 90s. It was identical looking cherry and red hot candies mixed together. I think the bag was yellow, one of the kind that hangs on a peg, around 7-12 oz. Any idea what that was? Can you provide any more description? Was there a mascot or any kind of graphics on the packaging? 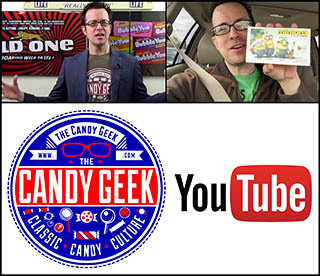 Were the candies themselves individually wrapped? What kind of wrappers did those have, if they did? If you can recall anymore details about what you’re thinking of, it will help to identify it. If it was a generic product, it will be incredibly hard to ID, though. Unfortunately I can’t remember many more details about the package itself, beyond being most likely yellow, with a window. It was definitely a “gotcha” sort of thing, where you wouldn’t know whether it was cherry or cinnamon, since all the candy was red and looked identical. The pieces weren’t individually wrapped, and I want to say they were about the size and shape of a Runts orange. I saw it at a K-Mart in Massachusetts, and it definitely wasn’t in one of those 3/$1 repackaged bags, so I’m assuming it wasn’t generic, but probably not a major manufacturer. Great find; I was beginning to think I’d never see what the box looked like. Unfortunately they quit making these at least 20 years ago. I can only speculate whether Nestle would reintroduce these now that they own the Wonka products. Daredevils also came in a package of 3 with clear plastic packaging with the logo above on them, I remember these they were awesome, getting to the centre was always a feat of endurance! I bought many of the 3 packs. All Kevin says is true and them some.